Expositions typically achieve their persuasive purpose through an introductory ‘position’ or ‘thesis’ stage, a series of arguments and a concluding reinforcement of the position. Expositions … which are geared towards curriculum learning goals, have been distinguished by researchers as analytical exposition because their specific purpose is to persuade audiences that a particular position or point of view is valid. In the academic domain, analytical exposition has become synonymous with the ‘essay’, with arguments presented as logical, objective reasons. The evidence for analytical arguments is typically the specialised ideas developed within a particular curriculum area of schooling and often takes the form of explanation sequences or other embedded factual genres. Another type of exposition, however, functions to persuade audiences to do something and is called ‘hortatory exposition’. Hortatory exposition is used extensively beyond schooling to get things done in the community in what’s called the civic domain. The educational linguist, James Martin, has argued that this kind of exposition is suitable for stirring people’s emotions and persuading them to challenge the way things are. In this impromptu speech, a Year 6 student, Jenny, deploys hortatory exposition to appeal to the audience to solve the problem of global warming. Humphrey, Sally. 2011. 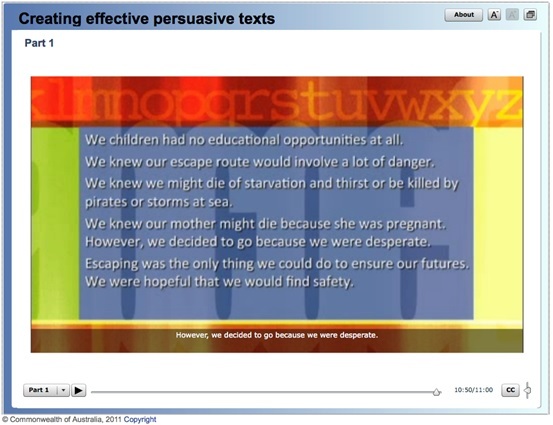 "Creating effective persuasive texts within and beyond schooling." NLNW Literacy videos. New South Wales, Department of Education and Training. | Link.